There are numerous ways to positively identify a monk seal, including: 1) Natural bleach marks; 2) Scars; 3) Plastic flipper tags; and 4) Applied bleach marks. To the untrained eye, one monk seal may look just like another. And, sometimes, even those who have been trained and spent hours, days and weeks observing monk seals confuse one monk seal for another. That’s because not all seals are flipper-tagged and even those that are sometimes lose the plastic identification tags attached to their rear flippers due to breakage. Too, a monk seal’s wounds—say from cookie cutter sharks—heal quite quickly, so a once dependable identifying scar can fade. Even the temporary three-digit “bleach marks,” applied by a trained biologist with the aid of your standard, over-the-counter, hair dye (thanks Clairol!) disappears every year when the seal goes through its annual molt. 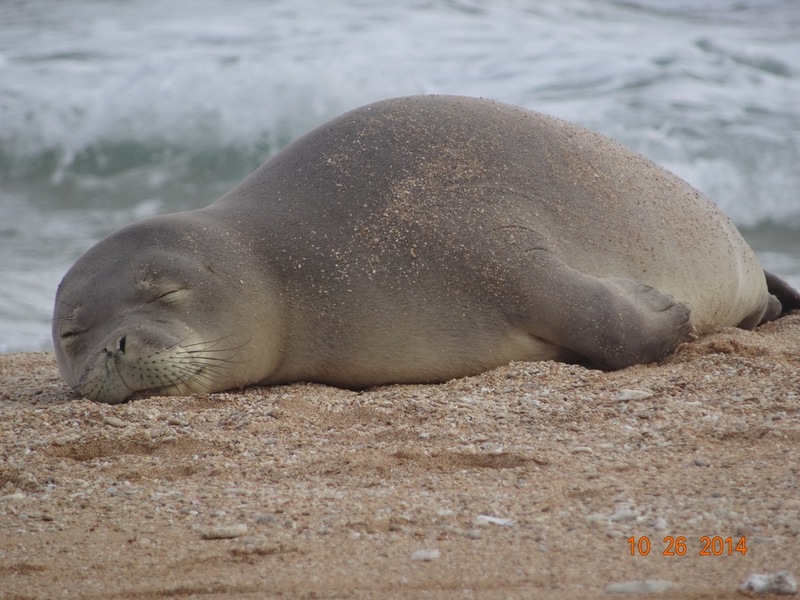 The ability to identify individual seals is important for the Hawaiian Monk Seal Research Program to track seals throughout their lifetime to gain information about their movement patterns, survival, reproduction, health, and more. On Kaua‘i, we regularly see 40 to 50 individual seals that we consider “resident” to the island. While some tend to favor Kaua‘i, we do know many move from island to island throughout the archipelago. Most recently, thanks to these unique ways to identify individual seals, two of those once seen around Kaua‘i have been spotted elsewhere. Too, earlier this year, an adult female started hauling out on the rocks near Brennecke’s Beach in Poipu and was bleach-marked V76. Late last month, she was reported by divers off Hawai‘i Island.